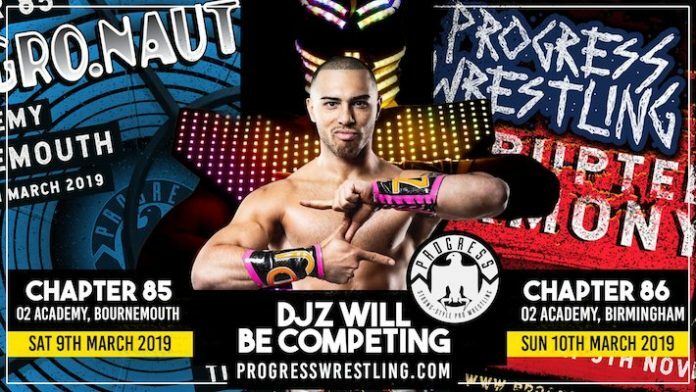 PROGRESS has announced the next confirmed talent for their Chapter 85 and 86 weekender. Former IMPACT Tag Team and 2 time X Division Champion DJ Z will be appearing for the company. Chapter 85 will be taking place on Saturday March 9th from the O2 Academy in Bournemouth and Chapter 86 will be taking place on Sunday 10th from the O2 Academy in Birmingham. This comes after the news that EVOLVE Champion Austin Theory would be joining the weekender. Theory became the new EVOLVE Champion at last months’ EVOLVE 117 event. Austin defeated both Fabian Aichner and Roderick Strong to win the belt. Theory pinned Aichner after hitting the Ataxia. after the match Theory took the microphone and declared that “EVOLVE is Theory.” The new champion also fired Priscilla Kelly as his manager. Darby Allin appeared and brawled with Theory until he escaped to the back. The working relationship between WWE and EVOLVE has long been publicised. WWE’s ties to PROGRESS are also now more in the limelight than ever before, with PROGRESS co-owner Jim Smallman apparently being groomed to run the NXT UK territory. Theory heading over to the UK might well be an opportunity to get him working with NXT UK Superstars and get more seasoning before moving up to NXT in either North American or the United Kingdom.